Get ready for a new full-loop communication tool that reimagines the power of 360 feedback. 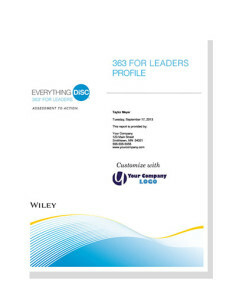 Everything DiSC 363® for Leaders combines the best of 360 with the simplicity and power of DiSC® to deliver a more productive, insightful, and informative experience and a roadmap of actionable steps leaders can take to improve their effectiveness. Everything DiSC 363® for Leaders isn’t just any 360. It’s a dynamic 360-degree feedback tool plus 3 personalized strategies for leaders to put into action immediately—a 360 + 3! The richness of Everything DiSC® comes together with the research-based Eight Approaches to Effective Leadership framework to help any leader—emerging high-potentials and experienced executives alike—incorporate critical feedback from direct reports, peers, and bosses into a development plan to increase their effectiveness in a leadership role. Whether coaching one-to-one or working with small groups of aspiring leaders, this powerful set of resources includes tips, techniques, and step-by-step guidance to help you introduce Everything DiSC 363® for Leaders into an organization, get buy-in from senior leadership, determine the scope and timeline for implementation, and deliver a fully customizable 360-degree feedback and coaching offering that meets your client’s specific leadership development needs. Two-part self-rating tool for leaders combines the research-validated, online Everything DiSC® and Leadership Behaviors assessments. The 22+-page 360° profile report provides context-specific feedback using intuitive easy-to-read visuals, clear definitions of the Eight Approaches and associated behavioral Practices, graphic illustrations that break down feedback by type of rater (e.g., managers, peers, direct reports), and detailed rater comments on all 24 Practices. In addition, the profile contains three personalized strategies that identify areas where leaders have the greatest opportunities for improvement, based on their unique DiSC® style and specific feedback provided by raters. Two-part research-validated, online assessment for raters combines the Leadership Behaviors assessment and an additional Leadership Requests survey that asks raters to identify which leadership practices they would like to see the leader engage in more frequently. Powered by our exclusive CommentSmart feature, raters choose from a variety of selectable comments that provide focused, balanced, and constructive feedback that leader can actually use. An unlimited number of raters can be engaged in this 360-feedback process.